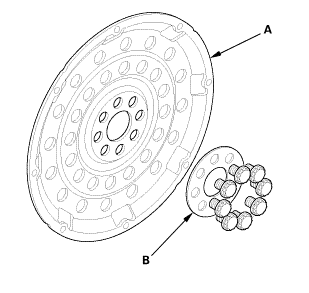 Remove the drive plate (A) and the washer (B). 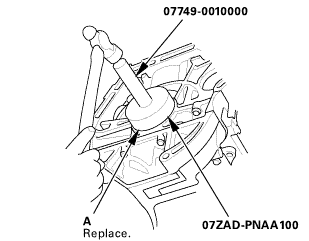 Remove the transmission end crankshaft oil seal. Clean and dry the crankshaft oil seal housing. Apply a light coat of new engine oil to the crankshaft and to the lip of the crankshaft oil seal. Use the driver handle, 15 x 135L and oil seal driver attachment, 96 mm to drive a new crankshaft oil seal (A) squarely into the engine block to the specified installed height. 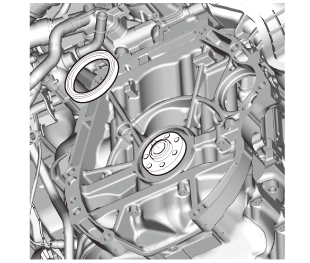 Clean the excess oil off the crankshaft, and check that the oil seal lip is not distorted. 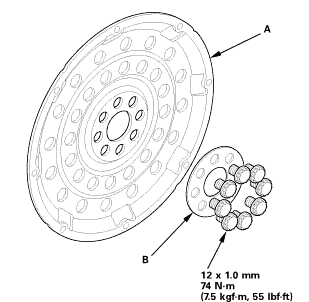 Install the drive plate (A) and the washer (B), and tighten the eight bolts in a crisscross pattern in at least two steps.